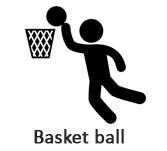 Basketball is a game that is played in teams consisting of two teams each having five players. It is played on a rectangular floor which is defined as court. The players gain points by throwing a ball through a hoop situated 10 feet above the ground. This instructional exercise gives the information about the fundamentals of how to play basketball. Any individual who is interested in learning the basketball can use this tutorial. It is prepared keeping in mind that the reader is unaware about the basics of the game. It is a fundamental guide to assist a beginner in understanding the basketball game. Before going through this tutorial, a person need to possess a desire for playing basketball and also willingness to know and gain knowledge about the game.